Just click the Whistle Post LINK below and go to page 11. This clinic demonstrates the many kinds and types of LED strip lights that are available, along with neat ideas and the techniques for using them to illuminate your railroad. If it’s new construction or an existing layout, LED lighting can provide an easy and cost effective method of making your layout shine! Light up dark hidden trackage, staging yards, under the table storage areas, and display cabinets. Working hardware samples of the LED strip lights will be shown along with power supplies, controlling devices, and mounting products. “Sheet Styrene Backdrops” Presented by Jim Fawcett. Jim has created flowing and seamless backdrops on his two deck layout from styrene sheets. He will show you how four distinctly different applications were used. All attachments are what Jim calls “temporarily permanent”; very stable and seamless, but removable. Also, the benefits of styrene include it being light, easy to clean and cut, handle, and attach. It can be used for backdrops on layouts, modules, and dioramas. As a bonus the leftover pieces are great for making models. Rick and Linda Spano’s layout is well known to many as it has been published several times including in Great Model Railroads. The large “N” Scale layout features long trains passing through the Canadian Rockies, an operating rotary coal dumper with live loads, a sea port and large city scene on the banks of a bay. Special lighting and sound effects and much more are featured. Jim Homoki's HO layout features the Penn Central and CNJ equipment and operations in the 1969-1974 era. Each main line runs as its’ own railroad, with interchange in the Newark area. Operating sessions are held monthly and with a recent extension to Jersey City, now lasts about 3 hours. Most locomotives are sound equipped, with control by Digitrax. Jim Grill’s N-Scale Layout based on the Lehigh Valley and Central Railroad of New Jersey running side by side through eastern Pennsylvania. It has been designed and built with operation as its basic theme. The model transportation system has been in operation since 1984 but has been rebuilt three times. The first was done because of a move to a new house. The second and third rebuilds were due to floods caused by Floyd and Irene. Ed Sproles’ layout is a freelanced HO scale New England railroad set roughly in the late 60’s to early 70’s. Motive power is leased from other regional railroads, mainly BM and MEC, it operates with NCE DCC. The double track mainline goes around the walls of a 30’ x 34’ basement, with one major city and freight yard. Elsewhere two industrial switching areas service a number of large commercial buildings. A connection to the north brings in Canadian traffic. The visible mainline is signaled and scenery is basically complete. Just click the Whistle Post LINK below and go to page 8.
will be available at meet. items to sell. There are always bargains! JACKSONVILLE, Fla. (March 27, 2015) - A commitment to employee development and diversity, combined with consistently high performance in key business areas, earned CSX (NYSE: CSX) a place as one of "America's Best Employers," according to a new survey published by Forbes magazine. "One of CSX's core values is 'People Make the Difference,' and being recognized as one of the most highly recommended employers is a true honor and testament to our collective efforts," said Michael J. Ward, chairman and chief executive officer. "CSX is committed to hiring and retaining the best and brightest employees from a variety of backgrounds, and offering opportunities for competitive pay and benefits in an industry that provides critical support to our nation's economy." Forbes determined its first-ever "America's Best Employers" list based on a survey of more than 20,000 American workers at U.S. companies and divisions of multinationals, nonprofit institutions such as hospitals, and government agencies. CSX was also recently recognized as one of the "World's Most Admired Companies" by FORTUNE magazine, as one of the G.I. Jobs' 2015 "Top 100 Military Friendly Employers," and as a "Best Place to Work in IT" by IDG's Computerworld. CSX prides itself on attracting and retaining a diverse and inclusive workforce, and consistently being a top employer of military veterans. One in five CSX employees have served in the armed forces and 27 percent of the company's new employees in 2014 has military experience. CSX is dedicated to providing employees with the tools and resources they need to flourish in their careers. The company offers best-in-class training and development opportunities, including the CSX Railroad Education and Development Institute's 60 front-line rail operations training programs. CSX has also invested in and equipped employees with advanced engineering and technology including robotics and mobile apps, which help them to be safer and more efficient in their daily tasks. A comprehensive employee health and wellness program provides an array of healthy lifestyle options, including gym facilities across the network and dedicated Health and Wellness counselors. Additionally, employees are encouraged to volunteer and give back to their communities through opportunities such as the Dollars for Doers program, in which CSX matches employees' volunteer time at eligible non-profits with company financial resources. ALTOONA, Pa., March 27, 2015 -- Norfolk Southern today launched a $53-million energy conversion project at its Juniata Locomotive Shop that will substantially reduce carbon emissions and water usage at the 70-acre facility. Norfolk Southern will replace the shop’s coal boilers with natural gas heaters and install a 1.2-megawatt capacity combined heat and power generator that will produce enough electricity to sustain the entire 16-building complex. 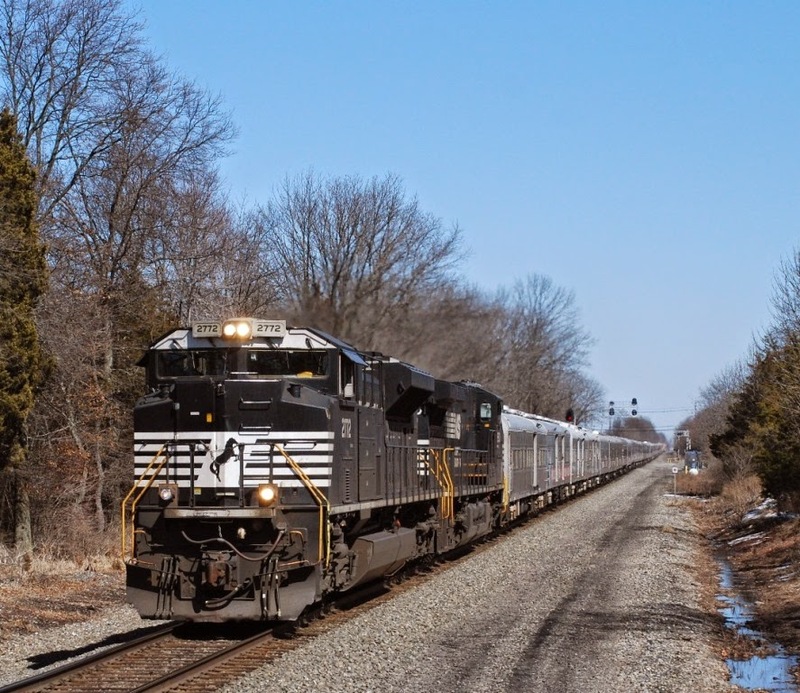 When completed in late 2017, Norfolk Southern expects the improvements to save about $4 million in electricity costs, reduce water usage by 49.4 million gallons from steam-water recovery, and eliminate more than 29,000 tons of carbon emissions in Pennsylvania on an annual basis. The project goes beyond equipment changes to include adding insulation, energy-efficient windows at key locations, high-speed roll-up doors on locomotive bays, and replacing roofing to ensure the full sustainability benefits of the investment are realized. 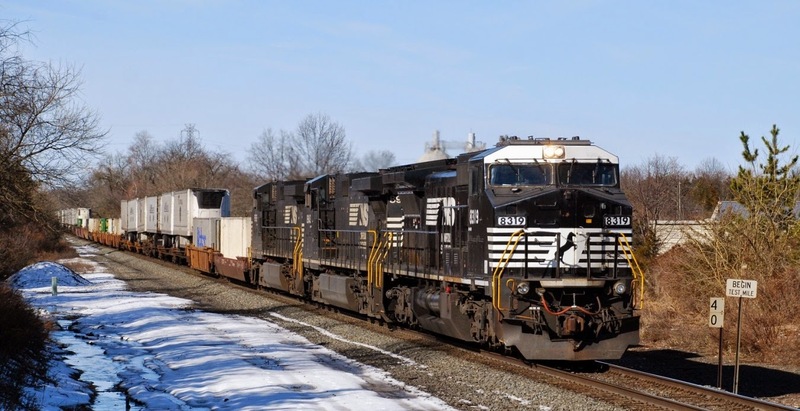 The project follows a comprehensive review of work demands and energy consumption at Juniata, the largest locomotive repair shop in North America and headquarters for Norfolk Southern’s locomotive rebuild program. The facility has about 1,050 employees who specialize in heavy repairs and engine overhauls. State Sen. Jon Eichelberger; state Rep. John McGinnis; Jim Frank, district director for Congressman Bill Shuster; and Blair Wimbush, NS vice president real estate and corporate sustainability officer, also participated in the project launch. ...is basically what passed by my vantage point on March 23rd near the Lehigh Line's MP 40 in Hillsborough (NJ) near CP SULLY. Here is what I saw starting with NS 11J. It would take Main 1, previously known as the Royce Runner, and hold there for a parade of eastbound trains. 11:58 NS 18N [Fostoria, OH to Doremus, NJ] - NS 9398 & NS 9590; loaded autoracks. NORFOLK, Va., March 25, 2015 – Norfolk Southern Corporation today posted its 2014 Annual Report online, highlighting record-setting net income, revenues, operating income, earnings per share, and operating ratio. The annual report, titled, “Behind Every Train,” includes a letter from CEO Wick Moorman that focuses on the people, equipment, and infrastructure supporting the company’s financial and operational achievements. 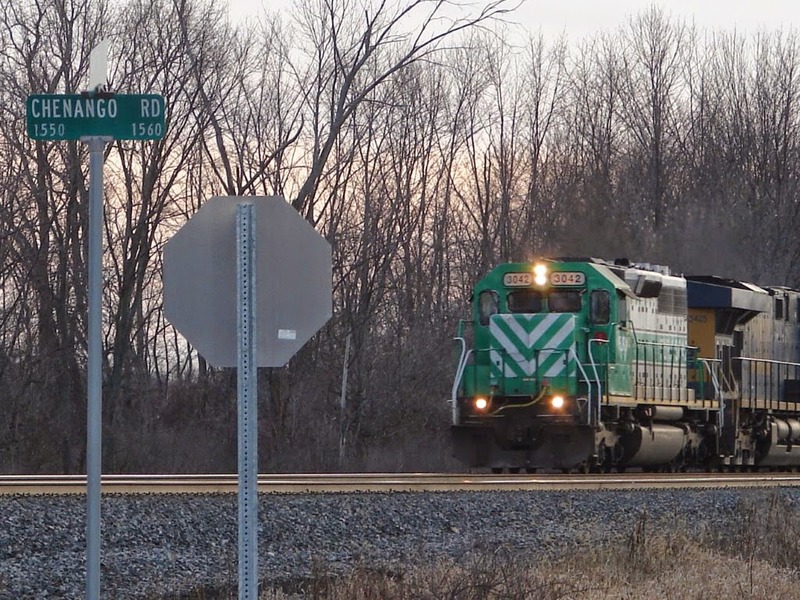 Moorman said, “As business began to rise dramatically following the difficult winter, we invested significant resources to align our people, equipment, and rail capacity with the volumes we were experiencing on the network.” The company hired 1,344 train and engine employees during 2014 and placed into service 169 locomotives. “We also initiated several infrastructure projects in the Chicago and upper Midwest areas to add capacity and operating flexibility,” Moorman said. “We remain committed to our proven strategy of operating an efficient, high-velocity railroad, which enables us to offer the best possible customer service and retain and grow business at rates that provide a superior return for our shareholders,” Moorman said. To request a copy of the 2014 Annual Report, call 800-531-6757, email annualreport@nscorp.com, or write to Norfolk Southern Corp., Corporate Communications Department, Three Commercial Place, Norfolk, Va. 23510-9217. 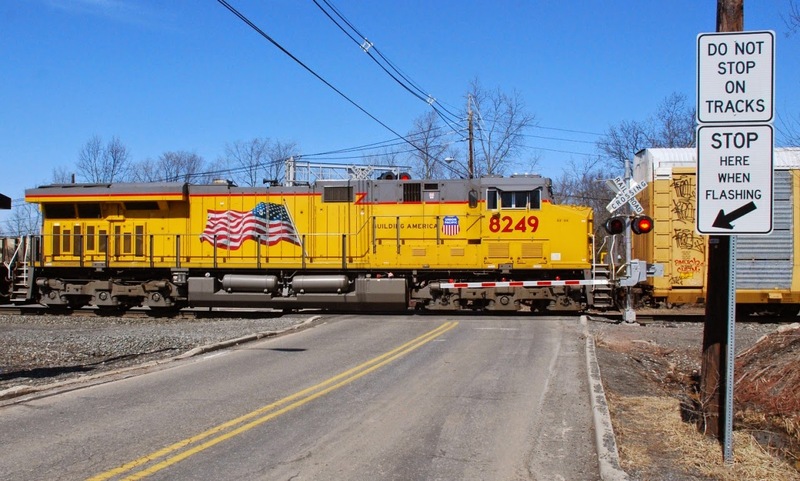 CP SULLY, located between the Valley and Roycefield Road grade crossings in Hillsborough (NJ) near LEHL MP 40, is one of my favorite locations for photography. This location is considered the west end of what was once designated as the Royce Running Track. Sunday morning would find 11J stopped on Main 2 due to some type of mechanical issue. As a result, 20E would bypass 11J by taking Main 1, a/k/a; the Royce Runner, around 9:55. Lead by the NS heritage unit Monongahela and NS 1076, 66Z would also traverse Main 2 later around 10:43 AM. Did not stay around after 66Z's passage as morning's icy winds did not make it feel too spring to me on this third day of spring! Received the following via email from George Miller, one of our customers. Here is Georgie's picture from this morning (3-22-15). We caught this on 66Z going east thru Manville, NJ. 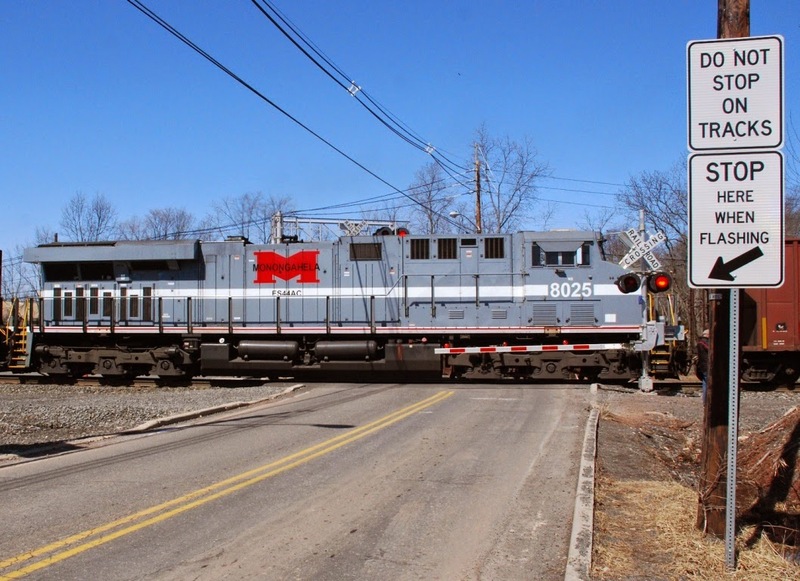 This train goes down the secondary line and terminates in Linden, NJ. Chenango Rd. 'Green of Spring'? Earlier in the day, snow was falling and accumulating again, further east on the CSX New Castle Subdivision. Down here in South Carolina, it was 70 and crystal clear, and every tree and shrub blossom that could bloom and fill the air with pollen was busy doing so! I hope your 2015 Vernal Equinox was pleasant, wherever you were, without itching of eyes or running of nose. Jacksonville, FL - March 19, 2015 - As CSX continues its commitment to first responder preparation, the company today presented a $25,000 grant to the Hazardous Materials/CBRNE Training Facility in York County, Va., to enhance training for Virginia's fire fighters and other responders. Grant funds will be used to purchase equipment to expand and improve the existing training facility's rail related hazardous materials capabilities including enhancing current and future railcar props; installing lighting and electrical connections to facilitate night training; expanding the classrooms to accommodate larger groups; and sustaining the facility with continued maintenance. "An emergency response team's ability is significantly strengthened when there is an opportunity to train in real life scenarios and work in situations relevant to today's emergency response community," said Chris Sadler, Assistant Chief, York County Department of Fire and Life Safety. "With this grant, the training facility can continue to provide state-of-the-art emergency response training for the Commonwealth's emergency responders." The Hazardous Materials/CBRNE Training Facility provides hands-on training opportunities for first responders on how to handle hazardous materials, particularly in the area of rail hazardous materials incident response. Its operations are supported by a partnership between the Virginia Department of Emergency Management, Virginia Association of Hazardous Materials Response Specialists, and York County Department of Fire and Life Safety. CSX previously donated to the facility in 2011. 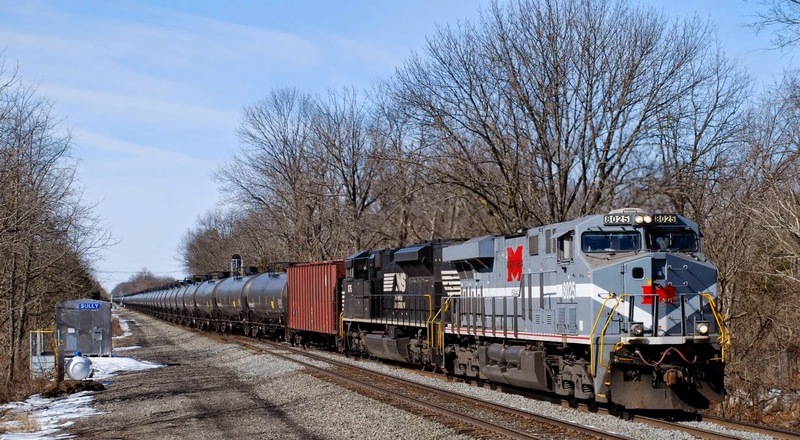 "CSX and first responders share a critical responsibility to protect Virginia's communities," said Romano De Simone, Director Hazardous Materials. "Safety is our first priority, and we work to create educational, hands-on opportunities that help our responding partners be well prepared to make the best, fact-based decisions in the event of a railroad incident." The grant is part of CSX's expanded safety training outreach to first responders and emergency personnel, which also includes the CSX Safety Train: Energy Preparedness Program that has trained more than 2,000 first responders from more than 350 organizations in 18 cities to date. CSX also launched the industry's first mobile application to share information about train and cargo information with first responders in the event of an incident. First responders interested in accessing the mobile application should contact 1-877-TELL-CSX. MCDONOUGH, Ga., March 18, 2015 –Norfolk Southern Corporation today held a ribbon-cutting ceremony to celebrate the expansion of its “Railroad University” and redoubled its commitment to superior transportation services for its present and future rail customers. Moorman, President Jim Squires, Executive Vice President Administration Cindy Earhart, and Executive Vice President and Chief Operating Officer Mark Manion were among the first to tour a newly constructed building on the center’s campus at McDonough, Ga., just south of Atlanta. The two-story expansion effectively doubles the training center’s classroom space, from 27,000 to 50,000 square feet. Today, even as some of the training center’s 21 staff members hosted tours in the new building, others provided instruction for close to 400 employees next door. The number of students could grow to 900 in the near future as the new building is occupied. Employees in the new space will receive enhanced technology-enabled interactive instruction, including use of tablets, touch screens, and simulation training. “After their classroom and practical experiences at the training center, employees go on assignment with the tools and perspective to make immediate contributions to the success of a 21st century railroad and the customers and communities that depend on us,” said Dominik Browne, manager of the facility. When it opened in December 1974, the center was the rail industry’s first dedicated facility for training and educating employees and quickly was dubbed “RRU” or “Railroad University.” Over the last 40 years, the career path for Norfolk Southern conductors, engineers, track and signal workers, and others has gone through McDonough and on to field locations throughout the company’s 22-state rail network. Prior expansions at McDonough included classroom space for supervisory and management courses in addition to technical training. Outside, 4 miles of track and a four-track rail yard complete with rolling stock give students opportunity to take their classroom instruction into a real operating environment.